Dendritic cells (DCs) are the key linkage between innate and adoptive immune response. DCs are classified as specialized antigen-presenting cells that initiate T-cell immune responses during infection and hypersensitivity, and maintain immune tolerance to self-antigens. Initiating T-cell immune responses may be beneficial in infectious diseases or cancer management, while, immunosuppressant or tolerogenic responses could be useful in controlling autoimmunity, allergy or inflammatory diseases. Several types of plant-derived components show promising properties in influencing DC functions. Various types of these components have been proven useful in clinical application and immune-based therapy. Therefore, focusing on the benefits of plant-based medicine regulating DC functions may be useful, low-cost, and accessible strategies for human health. This review illustrates recent studies, investigating the role of plant components in manipulating DC phenotype and function towards immunostimulating or immunosuppressing effects either in vitro or in vivo. Sildenafil citrate (Viagra) is used to treat erectile dysfunction and pulmonary arterial hypertension. The objective of this study was to analyze the action of sildenafil citrate on normal human erythrocytes in vitro at a concentration (2.5 mg/mL) higher than the prescribed for clinical conditions. Imaging of drug-treated erythrocytes was done using an atomic-force microscope in contact mode in air. Data analysis was performed using the scanning probe-microscopy software WSxM. The study revealed that the drug causes hemolysis of erythrocytes at high concentration in vitro at room temperature. The ghosts (membranes) of erythrocytes with reduced cell size and deformed shape were observed using atomic force-microscope imaging at low magnification. In addition, the high-magnification images revealed alterations in the nanostructural features of the erythrocyte membrane. There was a complete loss of characteristic membrane-architecture pattern. The root-mean-square surface roughness of the cell membrane after drug treatment was measured and found to be significantly less than that of erythrocytes in the native state. Sildenafil citrate causes hemolysis of erythrocytes in vitro at high concentration with significant alterations in morphometric properties, like change in cell shape, reduction in cell dimension, and disruption of membrane cytoarchitecture, along with a severe drop in membrane root-mean-square surface roughness. Food allergies are estimated about 1–2% in adults and 8% in children younger than 6 years. Allergic rhinitis is a common disease with a prevalence of 40% among different societies. Although, some foods play a role on exacerbation of allergic rhinitis symptoms, but still there are controversies about the role of diet on incidence or worsening the symptoms. The ongoing research demonstrates a possible relationship between certain foods and their induction of allergic reactions by modulating immunoglobulin E. A total of 100 patients (including both children and adults), between the ages 10 to 60 years, diagnosed with allergic rhinitis were selected for the study. Pregnant females and treated patients with antihistamine were excluded from the study. In vitro serum immunoglobulin E (IgE) levels mediated by a combination of food and inhalant allergens were detected by RIDA® Allergy Screen in blood samples. Data were presented as mean, standard deviation and standard error. A statistical analysis was performed by one-way analysis of variance (ANOVA). A p value < 0.05 was considered statistically significant. 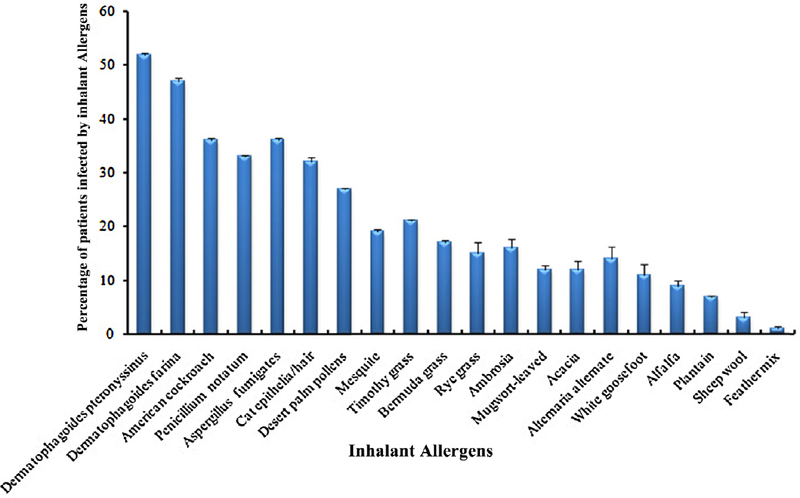 We reported that 63% of patients with allergic rhinitis were sensitized to common food allergens whereas the rest 37% of patients were not sensitive to any of the food allergens. Similarly, a correlation between the age groups of patients with allergic rhinitis and food allergy were also accomplished. We found the highest response rate for allergic rhinitis and food allergy (53.2%) for the people between aged between 21 years and 40 years. We also demonstrated that females are more prone to mediate allergic rhinitis as induced by food allergies as compare to males (i.e., 66.2% vs. 33.3%). Food allergy is estimated to be 4.5% in adolescents and adults with asthma, rhinitis or both. Rice, citrus fruits, black grams and banana are identified as major allergens for inducing allergic-rhinitis symptoms. Tramadol is an opioid analgesic used to alleviate acute and chronic pain. Nigella sativa oil is one of the traditional remedies with antioxidant activity. This study was designed in order to investigate the ultrastructural alterations induced by tramadol in the rat cerebral cortex and to find out any possible protective effect of N. sativa oil against these alterations. Twenty-four male albino rats were assigned to three groups. Group I received intraperitoneal and oral normal saline for 30 days. Group II received intraperitoneal injections of tramadol 20 mg/kg/day, 40 mg/kg/day and 80 mg/kg/day on the first, second and third 10 days of the study, respectively. Group III received intraperitoneal tramadol similar to Group II and oral N. sativa oil at a dose of 4 ml/kg/day for 30 days. Specimens from the motor area were obtained and processed for transmission electron microscopy. 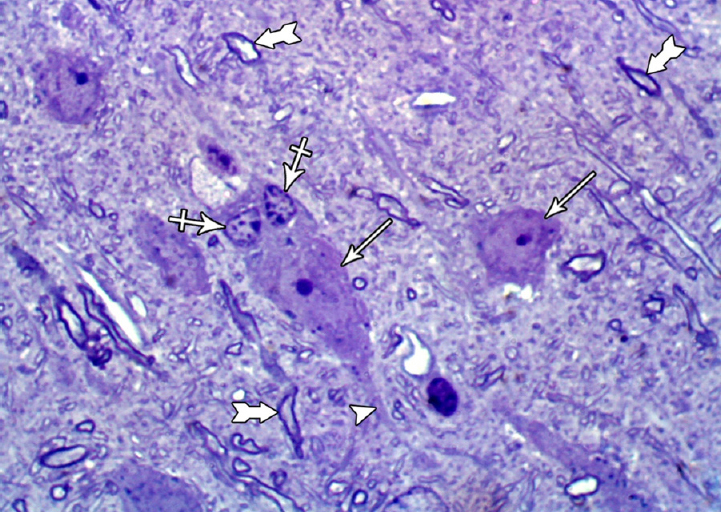 In the tramadol-treated group, pyramidal and granular cells appeared shrunken and showed ultrastructural features of apoptosis such as nuclear membrane invaginations, chromatin margination, dilated rough endoplasmic reticulum, dilated Golgi saccules, and mitochondria with disintegrated cristae. The myelinated axons showed disorganization and splitting of the myelin sheath and contained vacuoles and abnormal mitochondria. Administration of N. sativa oil partially protected the cortical neurons and myelinated axons against tramadol-induced changes. In conclusion, N. sativa oil alleviates ultrastructural apoptotic changes induced by tramadol in the rat motor cerebral cortex. Studies have clearly demonstrated the damaging effects of UV-B exposure on macroalgae, but few have reported the impact of UV-B on spore germination and development at juvenile stages. Therefore, this work aimed to analyze the effects of UV-B radiation on germlings of Nemalion helminthoides at the tetrasporophytic phase. To accomplish this, germlings of N. helminthoides were cultivated in the laboratory and separated into two groups. The control group was exposed onlyto photosynthetic radiation, while the treatment group was exposed to photosynthetic radiation + UV-B for 2 hours during a period of 12 days. Control germlings showed increasing cellular proliferation and accumulation of reserve substances, as well as intense ramification in the last observed stages between 9 days and 12 days of development. Moreover, the chloroplasts presented a typical globular pyrenoid, profusely traversed by thylakoid membranes. Treated germlings, by contrast, showed intracellular damage, such as cell wall thickness, loss of chloroplast organization, changes in mitochondrial cristae, and increasing atrophy of the Golgi bodies. Additionally, changes in developmental patterns were observed, including loss of polarity in the first divisions of carpospores and abnormal stem ramification. The quantification of autofluorescence data coincided with the ultrastructural changes observed in the chloroplasts of cells exposed to UV-B. It can be concluded that exposure to radiation changed the developmental pattern and morphology of the germlings of N. helminthoides. Among arthropods, ticks of the genus Amblyomma are of great medical and veterinary importance and present phylogenetic and taxonomic divergences given polymorphisms and phenotypic plasticity between subpopulations. 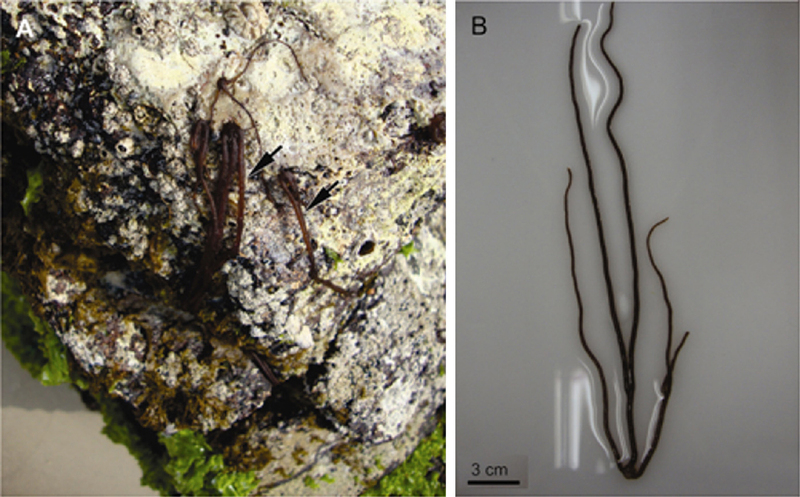 Generally, the male reproductive system and spermatozoon exhibit diversified morphology and ultrastructure species-specific, bringing new possibilities for phylogenetic and taxonomic issues. Therefore, the present study aimed to describe and compare the morphology of the male reproductive system and its germ cells of Amblyomma aureolatum, A. sculptum, and A. triste, intending to identify possible diagnostic features. Couples of the three tick's species were kept in colony, infested on rabbits and collected over 12 days of feeding. The males had their reproductive systems dissected, fixed and processed for histology and scanning electron microscopy. The results obtained here allowed the description of spermiogenesis stages and the comparison of spermatids morphology in the last stage of development. Furthermore, the testis of A. triste present an isthmus connecting the distal region of both, while in the other two species this structure could not be observed. 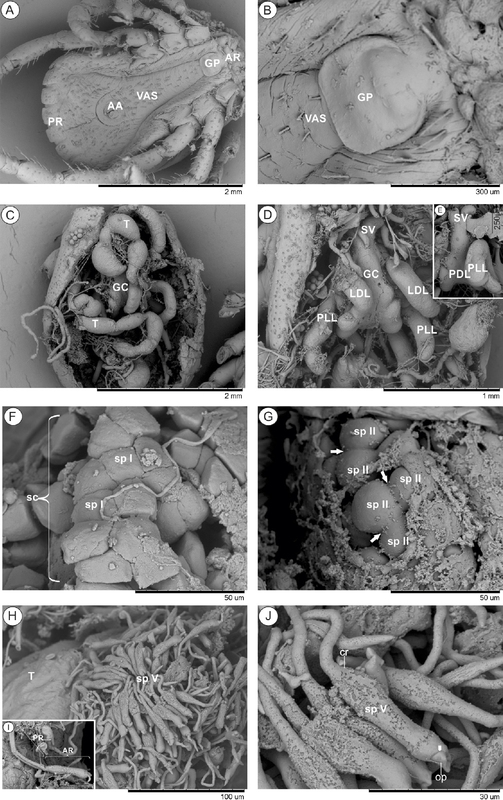 Some anatomical features were identified which can be used for taxonomic and phylogenetic studies, like the presence or absence of the isthmus connecting testis, spV cell shape, the shape of the operculum and the presence or absence of the rim on its base. Present study has been design to observe the ultramicroscopic structure of Gonadotrophs in the female bat Taphozous nudiventris kachhensis during the various phases of reproductive cycle. During the present study specimen were collected during Estrous and pregnancy to know the probable role of Gonadotrophs (FSH, LH) in respective stage of reproductive cycle. After collecting female specimen they were weight and dissect out for the pituitary gland and then those were fixed in ice cold gluteraldehyde. Gonadotrophs (FSH and LH) are mostly frequently observed cell types after Somatotrophs cells in the pars distalis of the female bat Taphozous nudiventris kachhensis. FSH cell during estrus is large, ovoid to polyhedral in shape with irregular shaped nucleus. Cell cytoplasm shows well developed Golgi apparatus, rough endoplasmic reticulum and mitochondria this indicating active state. During early pregnancy cytoplasm of FSH cell appears vacuolated because of dilation of rough endoplasmic reticulum. Mitochondria are spherical to rod shaped with lamellar cristae. During late pregnancy rough endoplasmic reticulum shows dilation. Golgi complex is juxtanuclear in position and mitochondria are numerous. 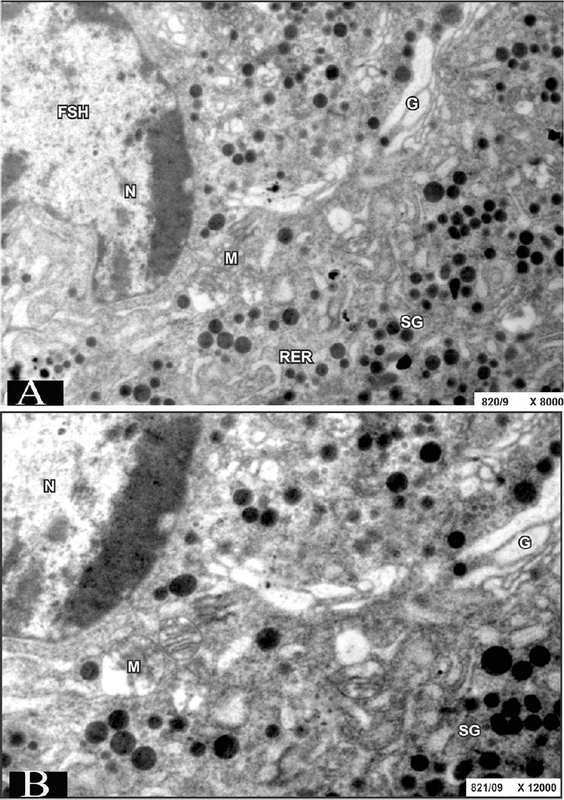 LH cells during early part of gestation are large with bilobed nucleus. Cell cytoplasm shows well developed rough endoplasmic reticulum heavily dotted with ribosomes and contains large number of secretory granules. Hypertrophied LH cell in pars distalis of bat during late pregnancy shows well developed rough endoplasmic reticulum occupies major part of cytoplasm. Golgi zone is well developed with dilated saccules. Secretory granules are very few.